One of the hardest things for me and my family was we are all picky eaters so coming up with healthy clean recipes was a challenge. I have slowly been experimenting and putting together some recipes! I hope to update this page as they all come together. So if it posted here it is picky eater approved!! 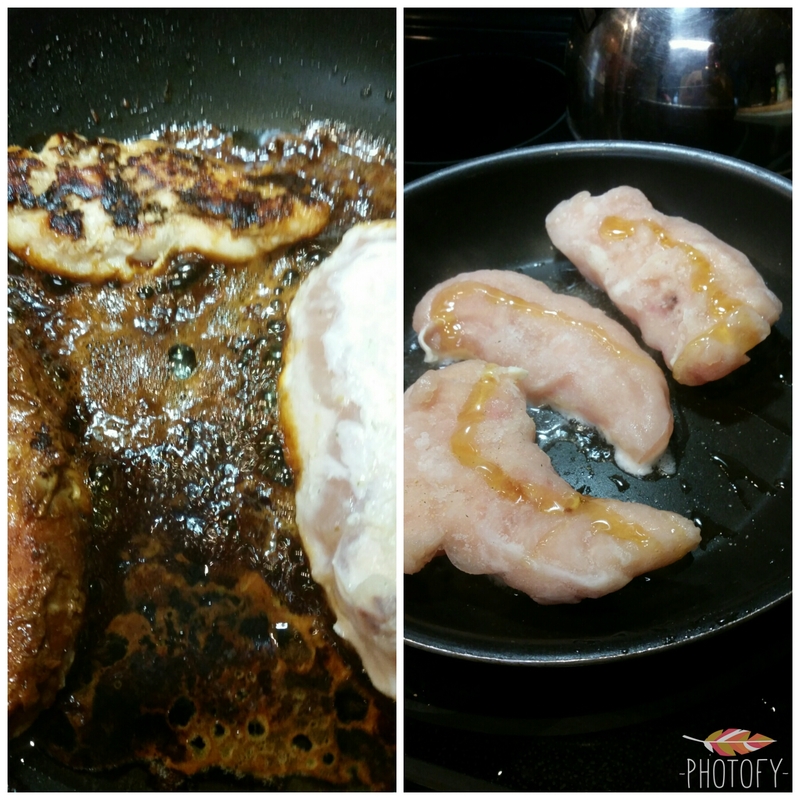 Not the best picture, I promise to get a new one up but the pic on the left is the honey and the juice forming a glaze in the pan!! Oh so yummy! Heavenly Chicken because even though it is healthy and good for you it still tastes like a little bit of heaven. Prep Time really depends on how much chicken you are cooking and how big of a pan you are using!! Boneless Chicken breasts Frozen or Fresh! I used the Frozen Chicken Tenders Only because it is the most economical but Fresh works even better! Place enough coconut oil in a Saute pan just to coat the bottom of a pan! Warm up the oil! Add Chicken If the breasts are large cut in half to be sure they are cooking thoroughly! Squeeze some lemon juice over the chicken and let it cook for 6 minutes!! Flip Chicken and repeat Honey, Lemon, and sea salt! The natural juices will begin to form in the pan, do not remove! Repeat this process till all your chicken is cooked! Because of the juices that form in the pan I take the first few pieces that I cooked and cook them each another min or so on each side to get the flavor of the juice!! Place chicken in Casserole backing dish! Back in oven for about 20-30 mins on 375 or until chicken is done! This will really depend on how big your pieces of chicken are!! That is it! Easy and very yummy!!! By making this in bulk you can Have some yummy meal prep chicken for the week for your salads or other meals!!! It is so versatile it will go with just about anything!! This is super easy and makes a perfect brunch dish!! 1/3 cup freshly grated Romano cheese (can substitute any grated cheese). Serving size would be equivalent to the yellow 21 day fix container. Step 1. Preheat oven to 350 degrees F. Spray a 9-inch square baking dish with nonstick olive oil cooking spray. Set pan aside. Step 2. In a large skillet, heat oil over medium heat. Add onion and cook, stirring frequently, until softened (about 3min). Step 3. Add broccoli and cook about 5 min. or until just tender. Transfer vegetables to prepared 9″ square pan. Step 4. In a large bowl beat together eggs, milk, cheese, salt, pepper, and oregano. Step 5. Whisk flour into mixture and then evenly pour over prepared vegetables. Step 7. Cool quiche for 10 min. then serve!